The Egyptian Communist Party (Arabic: الحزب الشيوعي المصري‎‎) (ECP) is the title of a modern political party in Egypt. The same name was also used by an older leftist Egyptian party founded in 1921. 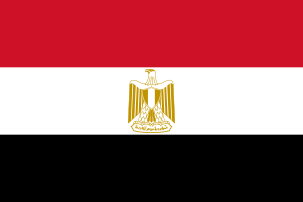 The modern Egyptian Communist Party was formed in 1975 by a number of members of the former Egyptian Communist Party. Under the regimes of Presidents Anwar Sadat and Hosni Mubarak the new Communist Party faced state repression and was barred from running in elections. The party however continued to operate underground until the overthrow of Mubarak in 2011. Despite having ECP members allegedly killed and imprisoned under Mubarak, the party have since been involved in mobilizing workers in 2011. On 10 May 2011, the ECP agreed to enter into a "socialist front" with four other Egyptian leftist groups called the Coalition of Socialist Forces, which includes the Revolutionary Socialists, the Socialist Popular Alliance Party, Socialist Party of Egypt and the Workers Democratic Party. ↑ ""الشيوعي المصري": قائمة عبد الجليل مصطفى الأقرب لنا للانضمام إليها.. وندعو قوى اليسار للالتفاف حولها". El-Balad. 4 January 2015. Retrieved 4 January 2015. ↑ "Candidates 'swinging' between unstable electoral alliances". Daily News Egypt. 3 September 2015. Retrieved 4 September 2015. ↑ "A Partial Guide to the Egyptian Political Parties". Connected in Cairo. 15 November 2011. Retrieved 2 October 2014. ↑ "Communist Party of Egypt resumes open political activities". Links International Journal of Socialist Renewalaccessdate=28 April 2011. ↑ "In solidarity with heroic struggle of the Egyptian people". Communist Party of Australia. 9 February 2011. Retrieved 13 December 2013. ↑ "Five socialist parties unite to impact Egyptian politics". Ahram Online. 11 May 2011. Retrieved 13 December 2013.